"Took the time to put a dirt mat on the floor from the house entrance to the basement. Did a very good clean up after the repair..."
"I used Clarke Basement about 5 years ago and have had a few jobs completed. They are always so very helpful and honest. I..."
I used Clarke Basement about 5 years ago and have had a few jobs completed. They are always so very helpful and honest. I recommend them whenever I can. I trust them totally. Chris has been so very helpful when I have a question or problem. Thank you for your work. "Will definitely recommend you to anyone in need of foundation repair"
My experience with Clark Basement Systems was fantastic. Getting a hold of someone was super easy. Their quote was very thorough and comprehensive; Chris answered all of our questions in a patient and easy to understand manner. The repair was done extremely well; Matt's work was clean and he was helpful in explaining the job before, during, and after the repair was complete. I would highly recommend Clark Basement Systems to anyone who is in need of foundation repair. I have used your services twice before and was impressed with both your products and your staff. I wanted to let you know the crew is here I am very pleased thus far, they are a great bunch of guys, especially Ben. He has exceptional customer service skills and has provided me with a lot of confidence in the work they are doing. He explains anything I ask about and does a walk through with me at the end of the day before they leave. It's been a pleasure working with you and your company, as well as Chris Luke initially. He too is a great team member and is very patient and not a pushy guy (great attribute for a salesman). Thank you so much, talk soon. Chris is a skilled carpenter by trade however he has been in the home improvement industry for 30+ years, building and renovating countless homes from the footings to the roof. He completed his carpentry apprenticeship in 1993, earning his certificate of qualification as a General Carpenter. Chris' broad range of experiences has given him a vast store of technical knowledge about how a home is built. Chris joined Clarke Basement Systems team in 2007. Since 2010 Chris has been primarily involved in the Foundation Supportworks of Ontario side of the business however he has been in various positions within the company which has allowed him to gain valuable knowledge about basement foundations and the processes needed to fix them. Chris brings his depth of knowledge and keen powers of observation to every home he visits. His clients appreciate his personable approach, thoroughness and integrity. He enjoys meeting homeowners; solving problems and helping people get the most out of their homes. Using PolyLevel® Injection, we lifted a concrete slab on the grade backyard patio, and with NexusPro® Sealant we sealed the cracks. PolyLevel® ensured that the concrete was stabilized and leveled. A customer contacted us from Pickering, Ontario about a crack that they found in the corner of a window in their basement which is a typical problem. It was continually leaking leaving the basement floor wet. The homeowner was delighted with the job our team completed and that the foundation was repaired efficiently, leaving the basement dry. Here we lifted the entire perimeter of a pool deck, no less than three inches on average to improve slope and eliminate trip hazards using PolyLevel® Injection. We also applied NexusPro® Sealant for specified areas. A home in Thornhill, Ontario had a wall foundation with multiple cracks in it. There was water seeping through the cracks causing the floor to be wet. The customer had previous plumbing problems and was tired of seeing water in their home. They wanted a dry basement and did not want to worry about water entry constantly. The customer called Clarke Basement Systems and talked to Chris Luke, who explained everything. Mark Dougherty and the team came in and installed FlexiSpan® wall crack repair on the cracks and then installed CleanSpace® over the top for extra protection. The patented Flexispan wall crack repair system has a 25-year warranty. They also installed a drainage system on the floor, below the cracked area to collect any water that tries to seep through. Now the basement is dry, and the customer can rest easy. We used PolyLevel® Injection to lift a pool deck in order to improve the slope and eliminate trip hazards. This lift was nearly three inches! We eliminated trip hazards around this pool using PolyLevel® Injection to lift and stabilize the deck. We used our PolyLevel® Injection for this pool deck to void fill, without lifting. This was primarily critter control as the dirt underneath the pool deck was missing due to burrowing animals. A Markham, Ontario homeowner contacted us due to a common issue of a crack forming from the corner of a window in their basement. It was continually leaking leaving the basement floor wet. A home in Ashburn, Ontario had an old sump pump that was outdated, and the homeowners felt that it was unreliable. They were worried it would not do the job of protecting the home from flooding. This problem stopped them from going away or sleeping comfortably at night in case their sump pump failed while they were gone. This worry of the basement flooding was restraining the homeowners from vacationing or relaxing. They called Clarke Basement Systems and talked to Chris Luke, who explained what we would do to fix the problem. The team came in and installed our TripleSafe™ Complete Sump Pump System in place of the old sump pump, and mounted two IceGuard® Discharge Line Systems on the outside of the home. The TripleSafe™ sump pump gives them three levels of protection and has a backup battery in case of a power outage. The Iceguards protects in the cold winter months, so they do not freeze and back up the system. Now the customer can sleep soundly at night and go away without having to worry about the sump pump failing and their basement flooding. Although this homeowner's basement had no signs of water damage or seepage they were still worried that in the future the crack would cause significant damage to their home. 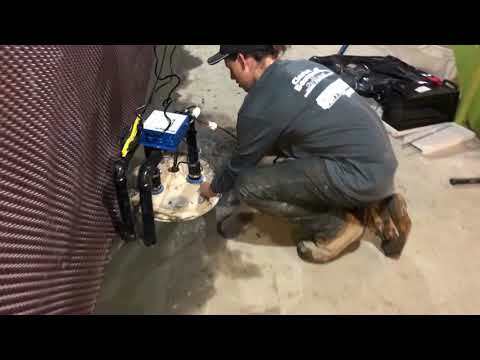 Our FlexiSpan® Wall Crack Repair System was installed to collect and drain water. This product was the perfect solution for our customer as it will never crack or dry out and bonds with the concrete foundation. A home in Stouffville, Ontario, had water in their basement due to the old sump pump. There were renovations done to the basement, and the homeowner knew it would get worse and ruin the basement. The sump pump needed an upgrade. The customer called Clarke Basements Systems to waterproof their home correctly, so they didn't have to worry about the basement getting ruined and avoid any leaking and flooding. Chris Luke who was the inspector told them everything that the team was going to do. Dave Jackson and the team came in and installed a WaterGuard® Below-Floor Drain with WaterGuard® ports to collect any leaking water and push it into the updated SuperSump® Premier Sump Pump System. Now the customer has a dry basement and doesn't have to worry about future flooding or leaks. A home in Stouffville had water leaking into the basement during spring thaw from snow melting. It was coming in through the perimeter of the basement in many different areas. The customer's storage items were getting wet, and the customer's feet were getting wet while doing laundry. Fixing from the outside and digging around the exterior was not an option because the porch was on three sides. The homeowners had lived there for a very long time, they were tired of having wet floors, and it only had gotten worse. The homeowners called us at Clarke Basement Systems to waterproof their basement. They talked to Chris Luke who inspected the area and explained everything our team would do to. David Jackson and his crew came in and installed a Clean Space wall system that would allow any water and moisture to flow down to the newly established full perimeter WaterGuard® Below-Floor Drain system. The water would then get directed into the newly installed SuperSump® Premier Sump Pump System with the UltraSump® Battery back Up and flow out through the Iceguard, away from the house. This system would allow the basement floor to be dry so that they can stored items in a dry place and no longer have wet feet when they do their laundry. The full perimeter WaterGuard® system comes with a 25-year warranty. The customers are happy to have a dry basement and their storage space back. A home in Goodwood, Ontario, had an old sump pump that was worrying the homeowner. They wanted to ensure if they weren't home and the power went out, their home would be dry. The customer called Clarke Basement Systems and talked to Chris Luke, who explained the process of our solution. Mark Dougherty and the team came in and installed the M53 Zoeller 1/3 hp Pump, UltraSump® Battery Back Up system and an IceGuard® Discharge Line System. The new reliable pump and battery back up will ensure the basement stays dry all the time, even during power outages. The IceGuard® drain prevents against freezing in cold weather, replacing the old drainage system outside the home. The customer is now happy knowing they don't have any worries about their home when they go away.